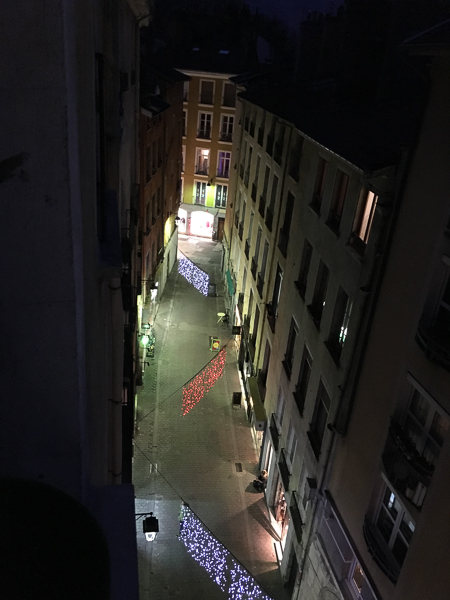 This is my first Christmas in France and Grenoble is where I’m making my home for a few months. 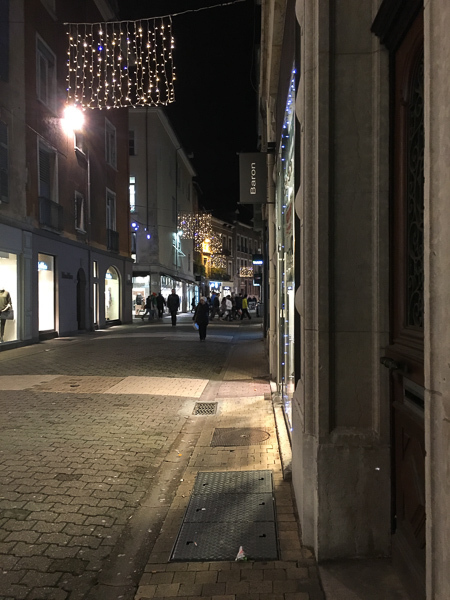 Grenoble is surrounded by the Alps so it's cold and beautiful with crisp air. 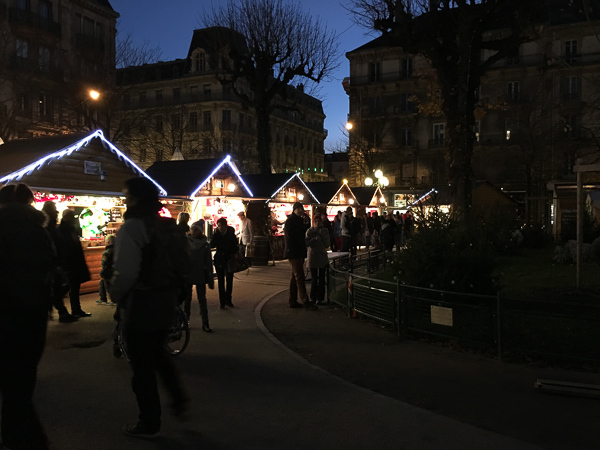 I wander out in the town exploring, enjoying and discover what the French Christmas Markets are all about. 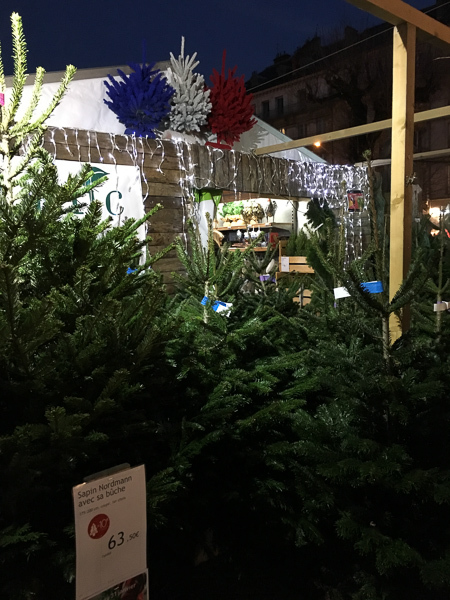 Christmas markets in France are a long-standing tradition, and Grenoble continues the trend with more than one collection of white tents and wooden booths. 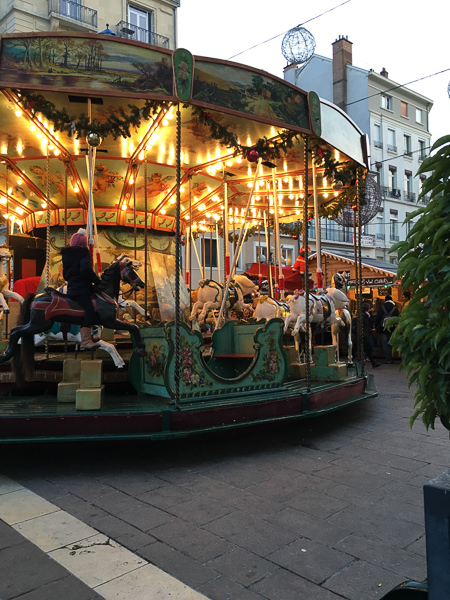 There's a carousel in the Place Grenette, along with a line of stands and decorated trees. Not limited to horses, the ride features bulls - complete with horns, pigs, and quite life-like rabbits. The rabbits are my favorites, and I was pleased to notice that they're usually occupied. 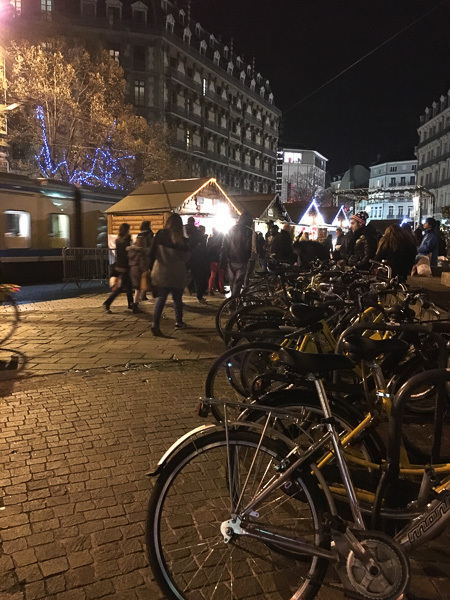 Maybe it was too early in the season, but riders were scarce that first weekend of the Christmas market. I walked by at several times when the lights were on and the music was playing, but there were very few occupied seats. 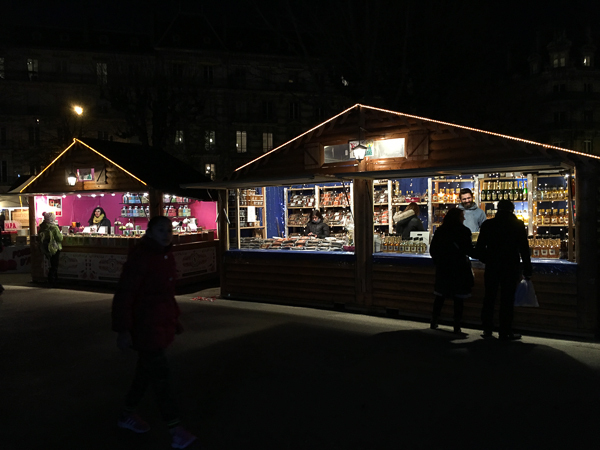 Since then, another stand has opened in front of the carousel offering mulled wine, hot coffee, and small chocolate-drizzled crêpes. There is usually a respectable crowd of people at the tall standing tables, and quite a few more children on the ride. 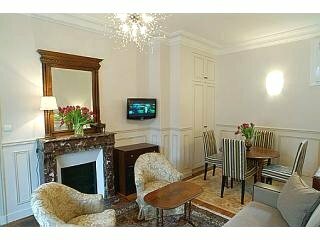 The Place Victor Hugo is the site of the main event, and it's quite a scene on a weekend afternoon. The crowd seems to be mainly families, parents and grandparents with children of all ages - toddlers being led by the hand, and a lot of strollers to dodge. There was another layer of teenagers parked around the edges, but they seemed to circulate, too, eventually. So it was a highly mixed crowd, but friendly and relaxed, people were out to have a good time. 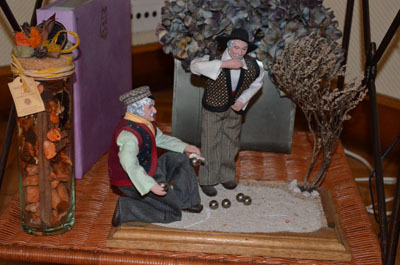 The center of the square features painted scenes with cutouts, where people were taking photographs posing as snowmen or elves or Santas. Call me slow, but I didn't immediately understand why there was a long line waiting outside another brightly lit hut. 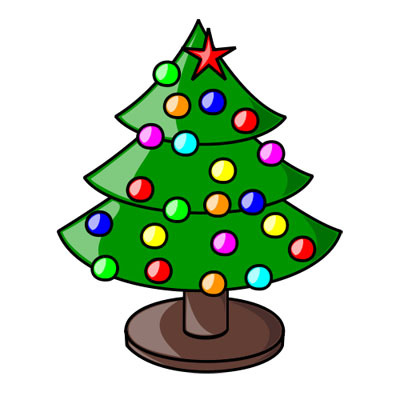 Père Noël (that's the French Santa Claus) was seated on a bench inside, with an assistant dressed like a mouse and a bucket of candy canes. His red suit, red hat, and white beard were familiar enough, but instead of being rotund, this Father Christmas looked distinctly thin. No bowlful of jelly here. I watched a toddler being introduced to barbe à papa or cotton candy. The assistant was wearing gloves as she worked the machine, the afternoon was getting chilly, but she rapidly produced an enormous shaggy cone. The woman held it out, but the little girl didn't move, she seemed more scared than pleased by the bright pink fluff. Her father took the cone and pulled her off a handful. She fingered it, but wouldn't take it, so her father showed her how it's done by swallowing it down. His broad smile was followed by the offer of another piece, and this time the toddler followed suit by cramming the entire fistful into her mouth. The sudden sweetness produced a huge smile, she licked her fingers, laughed, and then tore off another clump. After two more handfuls of pink fluff, the toddler was pointed in the direction of a large dog wearing a red and green sweater and a set of felt antlers. She ran to join the new crowd, and the cone was discretely deposited in a trash bag. It was fun to see cotton candy correctly used! Many of the booths offered merchandise; the market is obviously a gift-oriented event. There were a lot of scarves and hats on offer - it's cold here - and one featured ski accessories - Grenoble is ringed by the Alps and ski lodges abound. The two stands that featured locally made soap had good products and good prices. Everything was labeled biologique - organic - and a lot of the soap was made with milk. I'm used to cow's milk soap, and have seen goat's milk soap before, but savon au lait d'Ânesse, or donkey's milk soap, was new to me. I've since learned that donkey's milk has been used for cosmetic purposes since the ancient Egyptians - who knew? Unfortunately, the candles were oddly colored and the fragrance made me want to sneeze. Food is a popular gift item, and this is the place to find it. There are a surprising number of stands that feature beer, literally dozens of varieties and brands from around the world. You can make a selection of bottles and have them wrapped into a gift package, or simply ask for a glass. There were wine stands, some that featured a region, and some from a single vintner. These offered gift packs, but many of them also had a large electric pot on the counter, with a ladle and a stack of mugs. The fragrance of hot mulled wine hung over a lot of the market, it mostly featured cinnamon and added to the festive feel. You could buy a net bag of mulling spices if you found a favorite blend. 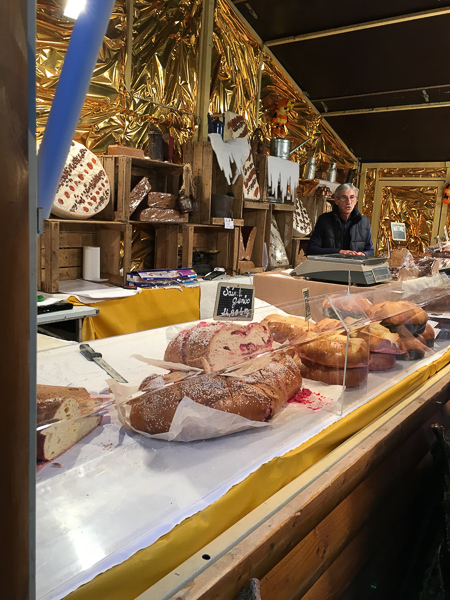 The bakery stands offered items I'd never seen before; I was reduced to hiding at the edge of the crowd to check out the signs without being greeted as a potential customer. There were huge loaves of spice cake and ginger bread, gigantic loaves that were cut to order into portions. Most of the stands also featured "cookies" - they used the English word, which I thought was interesting. One side of the stand featured an array of highly decorated cookies - Christmas trees, snowmen, sleds - and the other side featured undecorated, edible-looking cookies that featured lots of nuts and powdered sugar. There were also loaves of what I initially took to be challah - wrong! The beautiful, braided loaves were brioche, and from where I was standing, they seemed to be almost oozing butter. 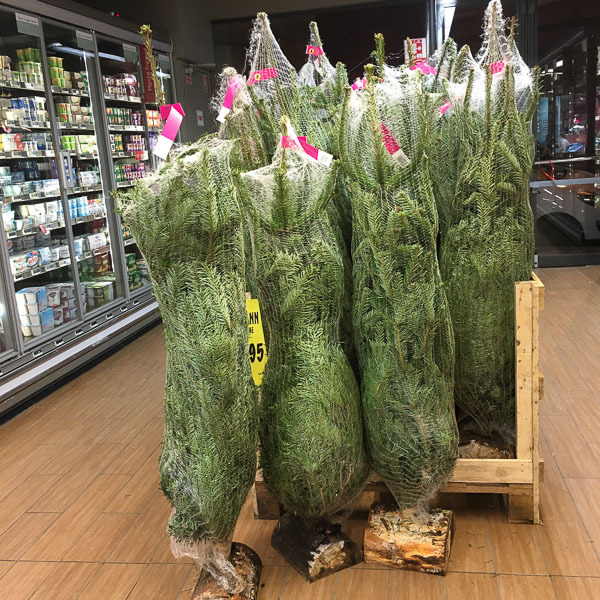 I watched more than one huge braid being wrapped in green paper and tied with red string. Cheese is another popular gift item. I'm not sure I'd offer cheese as a gift, it seems hard to anticipate someone else's taste, but there's no shortage of choices. 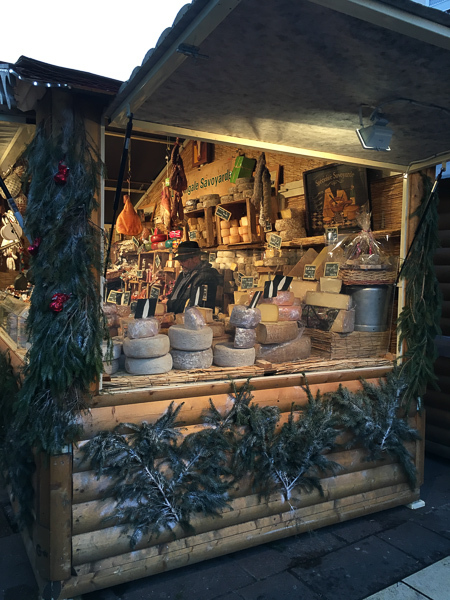 I saw some Italian Parmesan, but everything else was universally French, a huge selection that starts with cow - raw milk, pasteurized, aged, fresh, and everything in between - continues to goat, and ends with sheep. The largest rounds are the size of truck tires and sold by the slice. There are smaller cheeses that can be purchased whole or halved, firm or runny, on down to the tiniest crottin. I've learned to love goat cheese, even to the point of trying several aged varieties, but I freely admit that for me there can still be such a thing as too fuzzy. The sausage stalls offered a huge selection in every variety and size imaginable, fresh, dried, white, blood, whole, sliced, all ready to wrap. But on a chilly Saturday evening, these stands are onto something else, too - most of them featured enormous burners, huge skillets, grilled onions, and a large crowd. 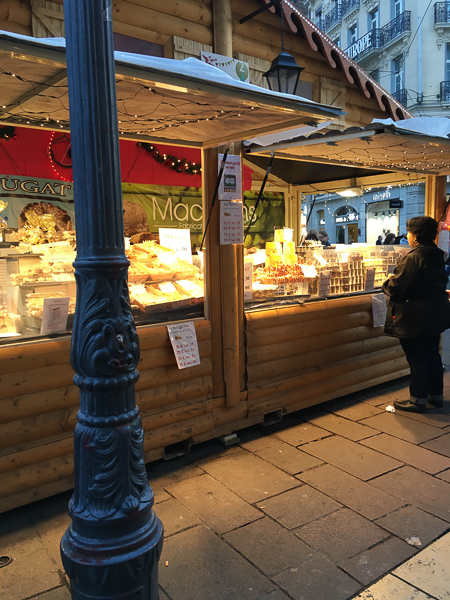 It would be an excellent idea to arrive hungry, because the food stalls are beyond anything I was expecting to find, even in France. Sausages turned on burners that reminded me of hot dogs, but that's where the comparison ended. You could choose between a sausage on a stick, or take a plate that included grilled bread and a layer of those browned onions. If that sounds like an obvious choice - who passes on grilled onions? - remember what I said about toddlers and strollers. The highly portable, sausage-on-a-stick option was extremely popular with parents. I don't actually know what's in the gigantic kettle pictured above. The guy was putting slices of cheese on top of the potatoes, but I didn't see what happened next. The crowd was so thick in this part of the market I didn't even try to go back. The crowds at the sausage booths were second only to those at the raclette stands, where hot cylinders were set against wheels of cheese that were then scraped off onto a split baguette. A pile of tiny pickles - cornichon - was added, and there was a shelf with several different pots of mustard on the side. 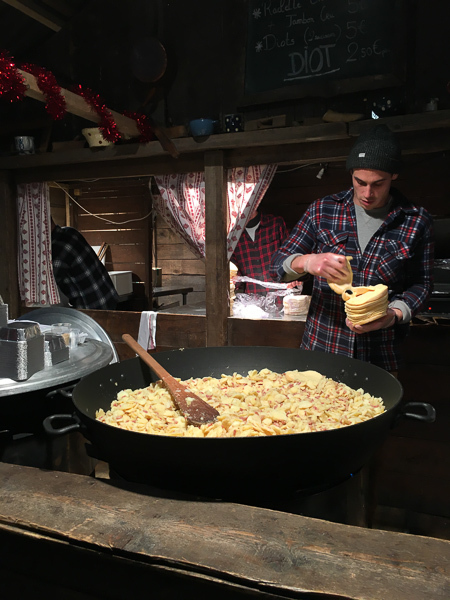 Aligot is a mixture of Cantal cheese, potatoes, butter, and garlic melted into a smooth paste that the vendors stirred with enormous wooden paddles. The fragrance at these stands was enveloping, a curtain of garlic and butter. The aligot was served in a mound on a large paper plate and the portions were huge. Here again, there was always a crowd. And the hot chestnut stand was easy to find, you just followed the smoke and the shells. Maybe that's why the people were so mellow - they were full of roasted nuts, baked potatoes and melted cheese. I was about to leave when the bandstand started up, and a group of musicians in red suits began to play. I have no idea how they got their fingers to move, the sky had cleared, it was getting dark, and the cold was intense, but they cranked out quite a song. Full disclosure - they weren't completely in tune, but it mattered to no one. People clapped, cheered, danced a little, it was a good scene. 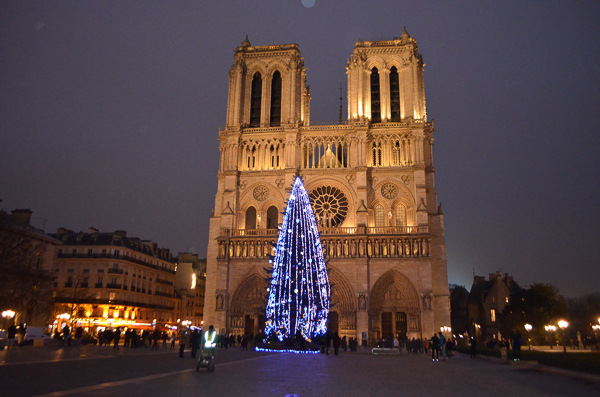 Then I walked back to my apartment through the narrow old streets of the quartier Notre-Dame. The Christmas decorations hanging overhead were lit for the first time. 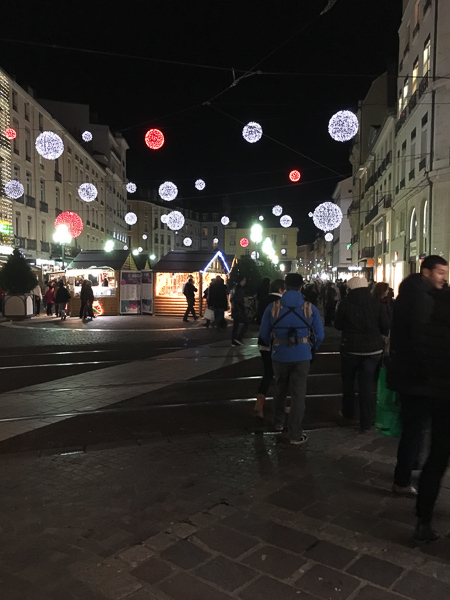 Guest contributor Beth lives part time in France where she immerses herself in French culture and explores new adventures. 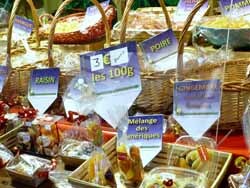 Read her other story adventure on organic market shopping in Paris.